“What I tell my law clerks is that we write these so that they are accessible to regular people. That doesn’t mean that there’s no law in it. But there are simple ways to put important things in language that’s accessible. As I say to them, the beauty, the genius is not to write a 5 cent idea in a ten dollar sentence. It’s to put a ten dollar idea in a 5 cent sentence. 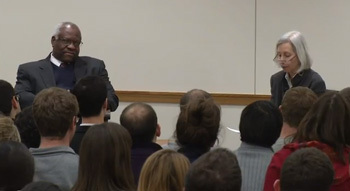 The law ought to be accessible to the average person, Justice Thomas explained during a recent appearance at Harvard Law School (above: the discussion with Dean Martha Minow).